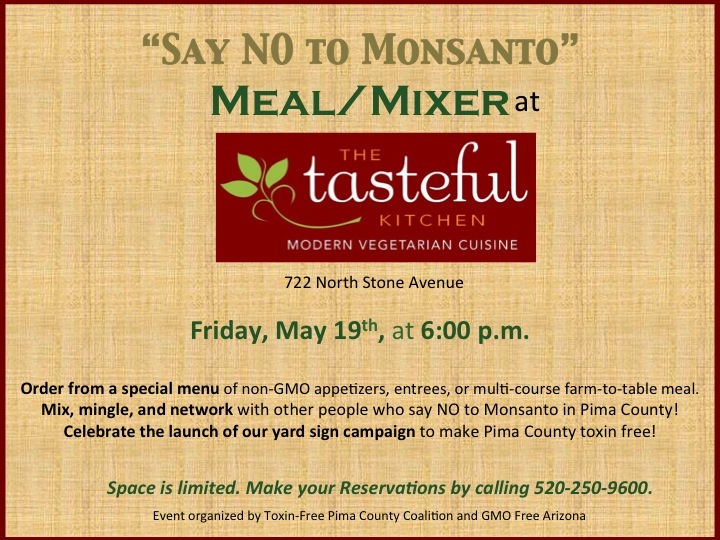 Don’t Miss Our “Say No to Monsanto” Dinner/Mixer at The Tasteful Kitchen This Friday, May 19th! Kick off March Against Monsanto weekend in Tucson by attending a special “Say No to Monsanto” Meal/Mixer hosted by GMO Free Arizona and the Toxin-Free Pima County Coalition at The Tasteful Kitchen, 722 North Stone Avenue. Not only will you will be able to order from a special menu of non-GMO appetizers, entrees, or seasonal farm-to-table meals, but you can mix and mingle with other people who want to resist GMOs, pesticides, and Monsanto’s presence in Pima County! You also can help us celebrate the launch of our yard sign campaign to make Pima County toxin free! We’ll have two different yard signs available by donation at the event, and we’d love for you to celebrate with us and be one of the first people to get a yard sign and send a powerful message out to others in the community! What better way to kick off March Against Monsanto weekend than to Eat Against Monsanto? (No Monsanto foods will be used in any of the items on the menu!) You can choose appetizers starting at less than $10 all the way to seasonal farm-to-table meals. All selections offered are vegan, non-GMO, and gluten-free. Space is limited. The last dinner we had at The Tasteful Kitchen sold out, so make your reservations as quickly as you can by calling 520-250-9600. Act now to make your reservations so that you can enjoy a wonderful meal; mingle and network with like-minded people; and join us as we launch our yard sign campaign! If you want to invite your friends, share this post or this Facebook page. Also make sure to mark your calendar to attend our special FREE screening of SEED: The Untold Story at 2 p.m. the next day, on Saturday, May 20, at the Murphy-Wilmot Library, 530 N. Wilmot Road.